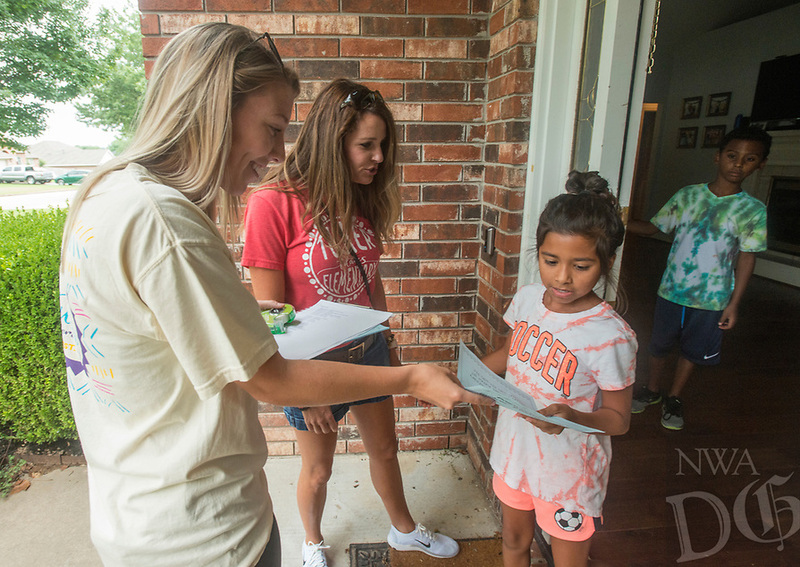 Halston Shaw (from left), a 4th grade teacher at Tucker Elementary, and Kim White, the school's library media specialist, deliver an invitation to 4th grade students Arianna Mata and Magdiel Berroa at their home Wednesday, Aug. 8, 2018, in a neighborhood near the school in Rogers. Teachers and staff at the school split into groups to knock on the doors of the school's more than 600 students to personally invite their family to the meet and greet at the school Monday. Casey Wolfe, a kindergarten teacher at the school, helped organize the community walk after attending a Professional Learning Community seminar over the summer break. Wolfe hopes the effort will get more parents involved with the school.